Jean and I spent Saturday and Sunday September 21st and 22nd in Reno, Nevada where good internet connection and comfortable accommodations permitted us to get caught up on company and personal business. Monday morning, September 23rd, after a good breakfast at a locally owned restaurant, Jean and I headed south toward our lodgings on the east border of Yosemite National Park. Our destination was a “rustic” cabin in Lee Vining, a small town at the base of Tioga Road which winds its way up to the eastern entrance to Yosemite National Park by way of 9,500 foot elevation Tioga Pass. 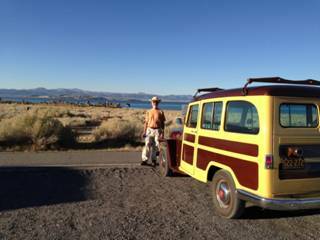 Lee Vining resides on the western shore of Mono Lake, a large, extremely alkaline lake with a salinity level several times that of sea water. Nevertheless, specifically adapted algae, water flies, and brine shrimp provide an ecological formula that feeds thousands of birds and water fowl that annually travel up and down the Pacific flyway. We were there during the offseason; however, we did get to see ducks, geese, and seagulls preparing to make their way south for the winter. 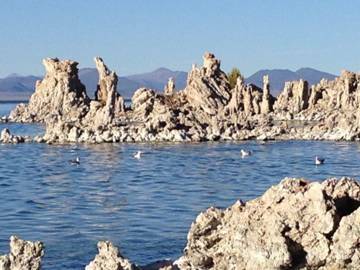 The most intriguing feature of Mono Lake is the presence of tall monolithic mineral formations. As recently as 60 years ago the lake level was 20 feet higher than today. 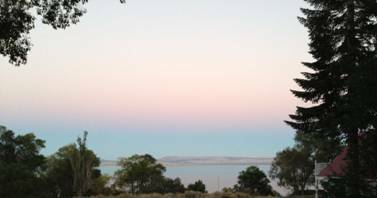 In the middle of the 20th century, it was decided to divert water from the snow melt tributaries that normally feed Mono Lake, to supplement the Los Angeles water supply. This resulted in the continual drop in the lake’s water level. Before the lake level was lowered, underground springs would release water onto the lake floor. When calcium compounds in the spring water reacted with the calcium containing lake water, irregularly shaped calcium carbonate formations were created on the lake floor. Many such unusual formulations are exposed now that the lake level has receded. 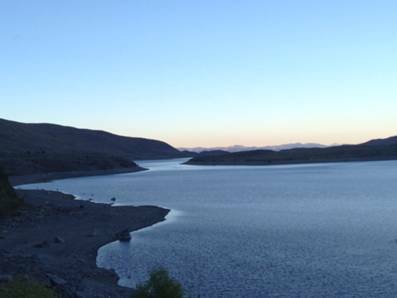 As a side note, a compromise has been negotiated between the powers to be to increase the water supplied to the lake by reducing the amount of water diverted to LA. 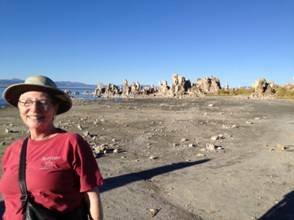 Jean and I enjoyed exploring these monoliths up close and subsequently touring fresh water June and Grant Lakes on the June Lake loop road a few miles south of Lee Vining, California before settling in for the evening. I should mention that prior to touring the region, Jean and I “sampled” the lower portion of the Tioga Pass and decided that due to its long, steep inclines, it was something that we would leave for the next morning. I did not sleep well that evening thinking about the best transmission shifting strategy for the assault on Tioga Pass the next morning.